The long awaited unicorns of the touring boot world have finally made themselves available. The lusted after Daytona line is now free to roam the webpages of RevZilla and can ship straight to your door from the US. The days of personally importing Daytona boots are no more - we are here to get you the most premium boots money can buy. Daytona Boots - a German brand which hand constructs each boot, paying the absolute closest attention to detail. If you are reading this, there is a good chance you already know of their reputation, so I will jump right to the models we are offering from Daytona. The keystone boot in the lineup is the Daytona Road Star GTX Boots - the king of touring boots, offering a perfect balance of protection and comfort with loads of adjustability. This model has been around for over a decade, tried by countless riders and proven itself to be a heavy hitter in the “buy it once, buy it right” category. Toe, ankle, and heel protection is standard, along with a very beefy reinforced shin plate to protect against peg impacts and the like. The boot has a full Gore-Tex liner, which is to be expected out of a premium quality boot, but the attention to detail to maintain the integrity of the Gore-Tex over time is astonishing. Daytona reinforced the material between your toes and the Gore-Tex liner, to prevent from any wear that your toenails would introduce over years of shifting. This unparalleled perfectionism is something that is just not present in some of the other premium brands out there. Female riders need not worry, there is also the Daytona Lady Star GTX Boots which are fundamentally the same as the Road Star, with a more lady-like cut. The Lady Star has a 6cm tall heel and 2.5cm tall insole, perfect if you are looking for a little extra ground clearance. 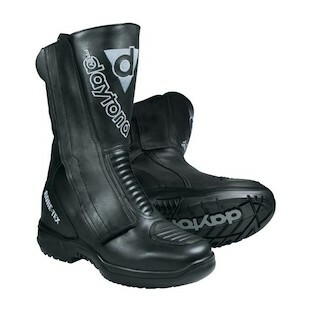 For us vertically challenged men, Daytona also incorporated a taller boot into the men’s lineup. Again, identical to the Road Star GTX in performance and comfort, the Daytona M-Star GTX Boots utilize a higher lift like the Lady Star’s design which is the tallest on road boot we have yet to carry. We are impressed! 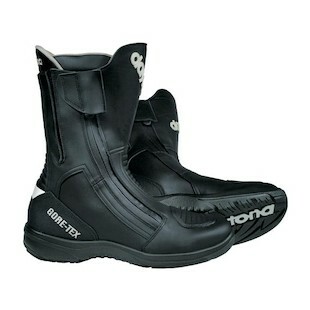 While Daytona boots carry a super premium price, they are without a doubt a super premium boot. There are Daytona customers out there that have had these boots for years, only needing simple sole replacements. Overall, if you are looking THE most premium touring boot, with the best comfort possible, your search is now over.